For preening in birds, see preening (bird). Grooming (also called preening) is the art of cleaning, grooming, and maintaining parts of the body. It is a species-typical behavior. Individual animals regularly clean themselves and put their fur, feathers or other skin coverings in good order. This activity is known as personal grooming, a form of hygiene. Extracting foreign objects such as insects, leaves, dirt, twigs and parasites, are all forms of grooming. 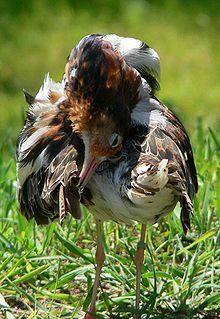 Among animals, birds spend considerable time preening their feathers. This is done to remove ectoparasites, keep the feathers in good aerodynamic condition, and waterproof them. To do that, they use the preen oil secreted by the uropygial gland, the dust of down feathers, or other means such as dust-bathing or anting. During oil spills, animal conservationists that rescue penguins sometimes dress them in knitted sweaters to stop them from preening and thereby ingesting the mineral oil which is poisonous. Monkeys may also pick out nits from their fur or scratch their rears to keep themselves clean. Cats are well known for their extensive grooming. One reason advanced for such grooming is to remove all traces of blood and other matter so as to not alert prey with the scent. Cats groom so much that they often produce hairballs from the fur they ingest. Many social animals adapt preening and grooming behaviors for other social purposes such as bonding and the strengthening of social structures. Grooming plays a particularly important role in forming social bonds in many primate species, such as chacma baboons and wedge-capped capuchins. 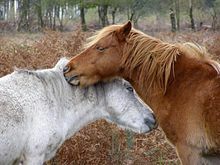 In humankind, mutual grooming relates closely to social grooming, which is defined as the process by which human beings fulfill one of their basic instincts, such as socializing, cooperating and learning from each other. In research conducted by Holly Nelson (from the University of New Hampshire) and Glenn Geher (State University of New York at Platz), individuals who chose their romantic partner reported more mutual grooming than others who focused in other types of relationships. Hence, this study hypothesized that mutual grooming related to relationship satisfaction, trust and previous experience of affection within the family. They claim that even though humans do not groom each other with the same fervor that other species do, they are groomers par excellence. Therefore, human mutual grooming plays an important role in pair bonding. In the same investigation, researchers found that individuals with more promiscuous attitudes and those who scored high on the anxiety sub-scale on an adult attachment style measure tend to groom their partners more frequently. These findings were also consistent with some of the functions of grooming: potential parental indicator, developing trust and courtship or flirtation. A recent empirical study by Seinenu Thein-Lemelson (University of California, Berkeley) utilized an ethological approach to examine cross-cultural differences in human grooming as it pertains to caregiving behaviors. Naturalistic data was collected through video focal follows with children during routine activities and then coded for grooming behaviors. This cross-cultural comparison of urban families in Burma and the United States indicates that there are significant cross-cultural differences in rates of caregiver-to-child grooming. Burmese caregivers in the sample groomed children more often than caregivers in the United States. 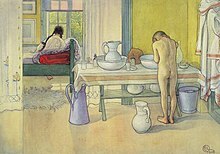 Additionally, children in the United States have short instances of concentrated grooming predominantly during daily activities that are structured explicitly around hygiene goals (bath time), in contrast to the Burmese child, whose grooming is distributed more evenly within and across daily activities. The Burmese parents maintained a constant vigilance with regard to risk of infection. The study is significant because it is the only study of human grooming to utilize naturalistic data. A female Anas platyrhynchos cleaning itself. A domesticated tortoiseshell cat grooming itself. Blue ducks preening their feathers. Peregrine falcon preening its feathers. ^ Graystock, Peter; Hughes, William O. H. (2011). "Disease resistance in a weaver ant, Polyrhachis dives, and the role of antibiotic-producing glands". Behavioral Ecology and Sociobiology. 65: 2319–2327. doi:10.1007/s00265-011-1242-y. ^ Garvey, Michael S.; Hohenhaus, Ann E.; Houpt, Katherine A.; Pinckney, John E.; Randolph, Elizabeth; Wallace, Melissa S. (2010). The Veterinarians' Guide to Your Cat's Symptoms. Random House. ISBN 9780307492852. ^ Thein-Lemelson, Seinenu (December 19, 2014). "Grooming and cultural socialization: A mixed method study of caregiving practices in Burma (Myanmar) and the United State". International Journal of Psychology. 50 (1): 37–46. doi:10.1002/ijop.12119. PMC 4320772. PMID 25530498.